Hey, it’s Friday, and by my estimation, Chanukah is right around the corner, so why not have another giveaway right? 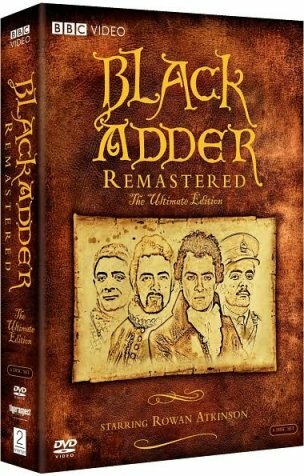 To win a copy of Blackadder Remastered: The Ultimate Edition (featuring Rowan Atkinson, Stephen Fry and Hugh Laurie), fill out the entry form after the jump. Contest ends on December 9, 2009, US entrants only, 18 years and older. Rowan Atkinson is deliciously twisted as the comic villain, Edmund Blackadder, in the enormously popular comedy series. Follow Blackadder in hysterical send-ups of the Middle Ages, the Elizabethan age, the Regency period, and World War I. This special edition contains new exclusive interviews and audio commentaries , making it a must have for all BlackAdder fans. If you like this video, you can head on over to the BBCAmericaShop.com and enter to win a $1,000 shopping spree! 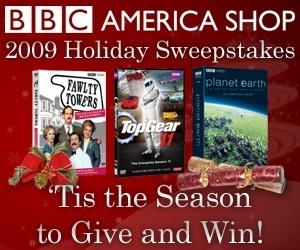 More details about the BBC America 2009 Holiday Sweepstakes after the jump. BBC America Shop gift certificate for the friend or family of his or her choice.